Since 1950, Jensen Mixers Has Been the Industry Leader in Side Entry Tank Mixers. Our Core Focus is Side Entry Tank Mixers. Unlike many of our competitors, we at Jensen Mixers focus on one product and one product only – side entry tank mixers. In fact, we were pioneers in side entry mixer technology and many of our mixers have been operating trouble-free for decades. Design, engineering and manufacture of our side entry mixers and parts happens right here in the United States of America. That gives you the distinct advantage of having access to the people who created your mixer when you have questions, need service or replacement parts. The Jensen Type F Mechanical Seal is designed for long life at low cost. Materials of construction were especially selected to suit petroleum applications. If seal replacement is necessary, wearing parts can be purchased from Jensen separately, cutting replacement cost in half. When it’s time to replace your mechanical seal, nothing is easier than a Jensen Mixer. 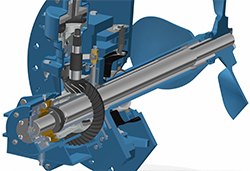 We’ve earned the nickname of ‘mechanic’s friend’ because of our unique quick-change mechanical seal system that can be completed in less than thirty minutes. Vari-Angle Option for Virtually No Manual Tank Cleaning. Mixers equipped with the optional Jensen Vari Angle feature will completely remove sediment build ups from storage tanks which means freedom from manual tank cleaning. The Vari Angle feature is a precision, ball-type hinge that allows 60º angular movement. This allows the flow stream to be directed to any area of the tank assuring complete tank cleaning. Sealing is accomplished by Teflon® impregnated non-asbestos packing which is fully adjustable to eliminate leaks. Mixer weight is supported entirely by two heavy duty, pin type hinges. As with all Jensen Mixers, no turn-buckles, tie rods, bases, or other extra supports are required. Angle changes can be made easily by one man, or automatically controlled by the optional Mechanical Actuator. 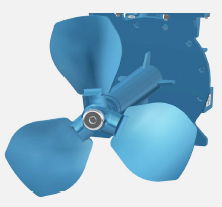 The exclusive Jensen Pitch-Adjusted Propeller is a highly efficient, three blade, marine type propeller precision set and permanently fixed at our factory to assure superior mixing performance in each individual application. Although our mixers have been known to last for decades, we understand that some parts simply wear out. That’s why we’ve made the commitment to never discontinue any of our parts so that you can be confident that we’ll be able to provide the support and parts to keep your mixers running smoothly until you are ready to take your tanks out of production.